I am at our Provincial Chapter this weekend, where we are preparing for the Society's General Chapter next summer, whose theme is Life Unfolding: mission for the emerging future. In a world in which there is so much hatred, brutality and brokenness, and yet so many signs of hope and promise, what are the calls for us, as women of a Heart which is only love, tenderness and mercy? And today, in the midst of all this, Advent has begun: a time of hope and promise, of light in darkness; a good time to ponder the calls we have been identifying, and to be transformative, restorative love in our pain-filled world. 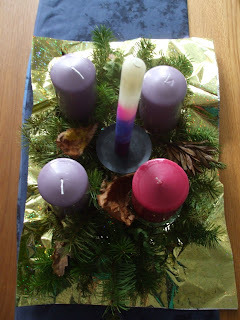 And I feel that for once in my life I will be ready for Advent! Not only have I written over half my Christmas cards, but I have, more importantly, prepared what promises to be a rather fragrant Advent wreath. I hadn't intended it to be scented, but that's what the shops and my foraging presented me with, and so a fragrant wreath is what I now have. While I was on retreat at Llannerchwen I gathered pine branches which had fallen in the strong winds, and a few leaves and acorn cups. When I get home I will pick and add some rosemary and lavender from the bushes in our garden. Three of the candles are lavender-scented, and on Gaudete Sunday the scent of "lily bloom" will be added to them. My central candle was a gift some years ago, which I had kept in what is now a well-perfumed drawer: it is a heady mix of several scents - including frankincense, cedar, sandalwood and jasmine - and its label promised peace and harmony, so it seems an especially good candle for celebrating the coming of the Prince of Peace into our world. I like the way it swirls from deep purple to pink to white - a gathering of Advent waiting into the immense yet simple event that is Christmas. May this Advent, whether fragrant or not, be a blessed time of waiting in joyful, expectant hope for all of us.